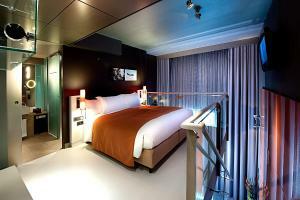 This 5-star hotel with free Wi-Fi and design interiors is just 100 metres from Munich Main Station. 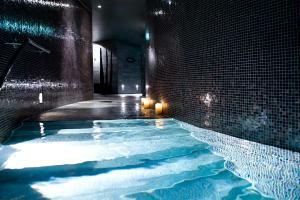 Spa facilities at the Sofitel Munich include an indoor swimming pool, sauna and modern fitness studio. Sofitel Munich Bayerpost is an historic 19th-century building, which features Avant Garde architecture. All rooms are air-conditioned and include a European king-size bed, flat-screen TV and an exclusive Nespresso coffee machine. Guests can enjoy French specialities at the elegant Délice La Brasserie as well as a rich breakfast buffet at the Schwarz & Weiz restaurant. The Sofitel Bayerpost's Isarbar serves exotic cocktails and select wines. The Sofitel is a 10-minute walk from the Karlsplatz/Stachus pedestrian shopping area and the Theresienwiese, the location of Munich’s Oktoberfest Beer Festival. Marienplatz Town Hall Square is just a 20-minute walk away, or 2 train stops from Hauptbahnhof (Main Station). On-site parking is available at the München Sofitel. There are direct underground trains to Munich’s Neue Messe Exhibition Centre and direct S-Bahn (city trains) to Munich Airport.